A thumbnail sketch of what I think the hexagon libraries would look like, I didn’t want a central building where it all stands. I wanted to create the vastness of the hexagon buildings which is spread across a large area of land; the library is taking over the landscape. I haven’t settled on one image I have created many other images that are similar but have a different layout. 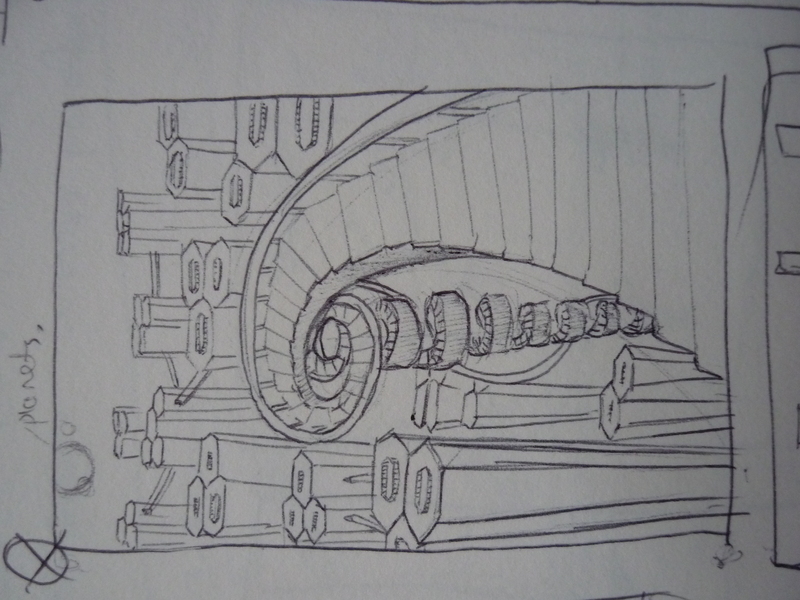 The stairs where inspired by ‘a spiral staircase, which winds upward and downward into the remote distance’ ( Jorge Luis Borges, 1944). 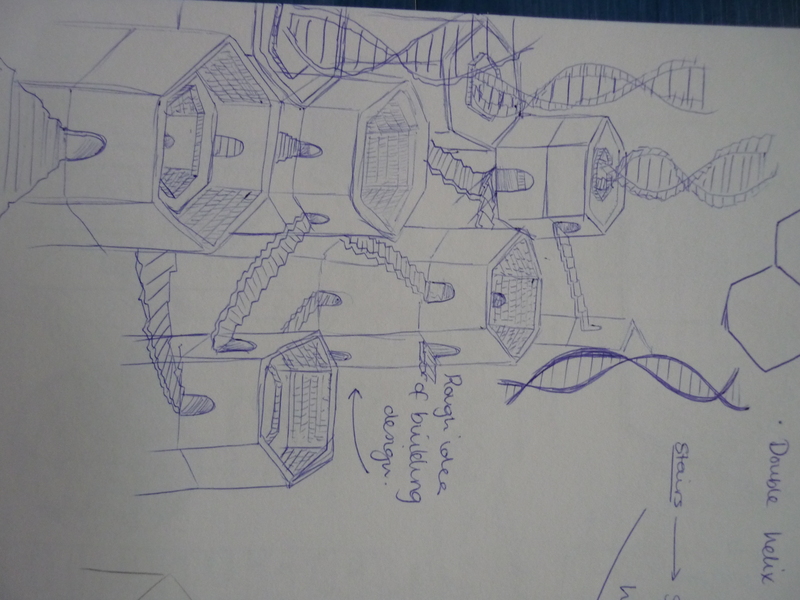 Thinking about the nature of the text I used a DNA double helix to form the shape of the stairs as I thought this would link into life and it’s a pleasing shape to look at. Down the stairs is taking a first person perspective and taking the viewer on a journey. A very rough sketch and again I have drawn other perspectives to see which one works best. 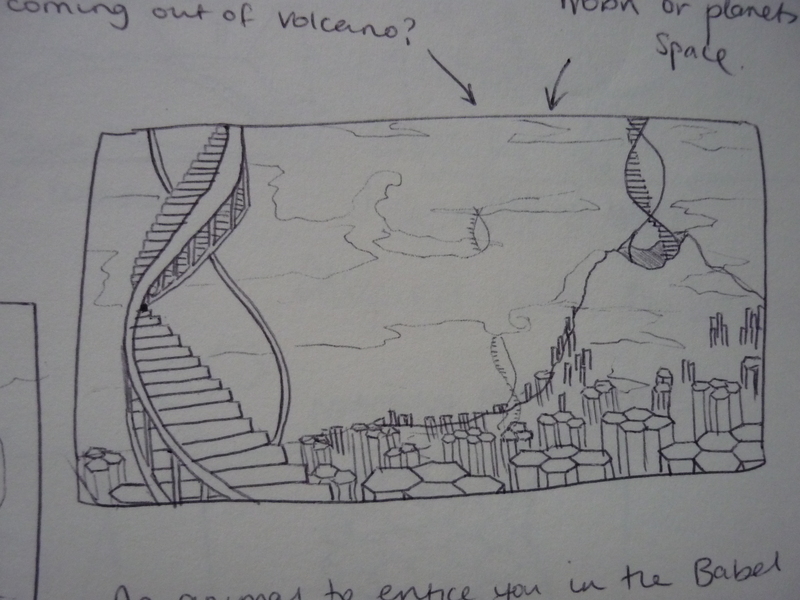 Looking back at the Seven Principles for Visual Culture Education by Paul Duncun I considered using the perspective of the scene to show power; tall buildings that tower over people and the land suggest that it has dominance over the land. In some sense it could be seducting the viewer to go and explore this weird land of odd buildings. I will have to explore this further by using colour and texture to make the scene enticing to look at. I have noticed that I tend to try and make a story behind the main text, I think this allows me to create images more easily as I have a tale to follow. I can then lead one image onto another and this allows me to use my imagination more because I am creating in some sense a mini film in my head. Using a “camera” allows me to see different and interesting angles that would hopefully capture the viewers attention. After I have created even more sketches and designs for this text I think I am going to create some into rough final pieces, this will help me go further in visualising the text and allow me to explore my imagination. DNA, Genes and Chromosomes [internet]. Available from: http://www2.le.ac.uk/departments/genetics/vgec/highereducation/topics/dnageneschromosomes, [Accessed 30 January 2014, 11.55am]. This entry was posted in More Sketches. What is the Masters in Illustration? These are some of the points that I will have to incorporate into my learning when studying for the masters. I already feel that I am slowly finding my own voice and I am self critical of my work however, I still think there is a lot to work at which I will show throughout this blog. When creating an image I must think of how the character for example, is portrayed to the viewer so I can get the viewer to empathise or oppose against the character. This will make my drawing more efficient and will communicate to the viewer easier. 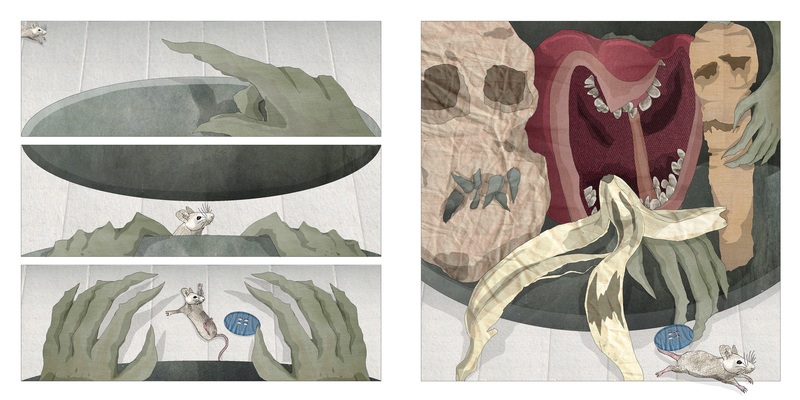 For example, I created this illustration for last years project; a mouse who has to face monsters. This shows the vegetables and hands are larger than the mouse so this creates the sense that the mouse is being threatened and the vegetables have the power. It’s like a recipe on how to live your life e.g. aims, how you should look, think, depending on culture, politics etc. I must be clear on hat I am representing as if I get this wrong the viewer could have a negative reaction towards my image and get the wrong message. My work is very much influenced by my personality and how I grew up,for example I like colour and a sense of calmness in my images. Although this changes depending what the brief is and what I want to portray. Linking to intertextuality and multimodality I am heavily influenced by what mood I’m in and what music I am listening to. When listening to chilled out music I tend to use subtle colours that work together, when listening to more up beat music I use colours that are bold and bright. I will have to weirdly consider what music I should listen to when creating future pieces. 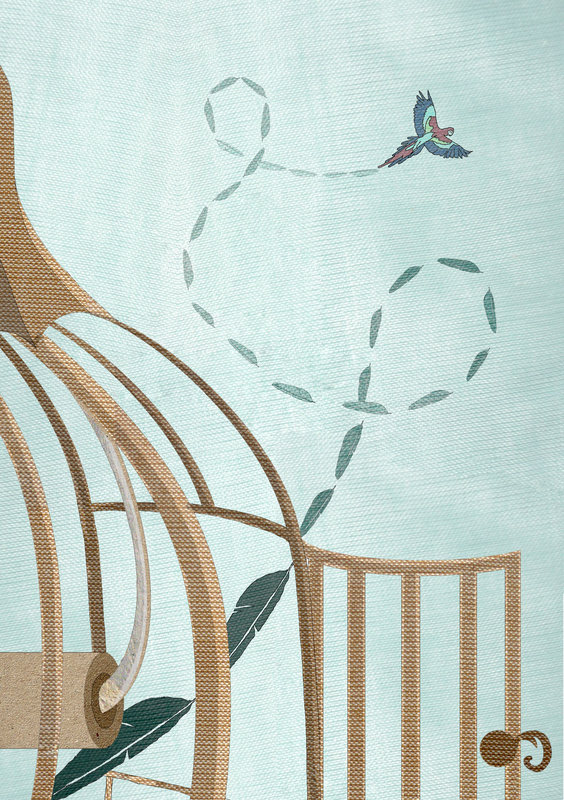 This entry was posted in Master in Illustration and The Seven Principles for Visual Culture Education. This entry was posted in Creating Sketches. My name is Emily and I am currently studying a Masters in Illustration. 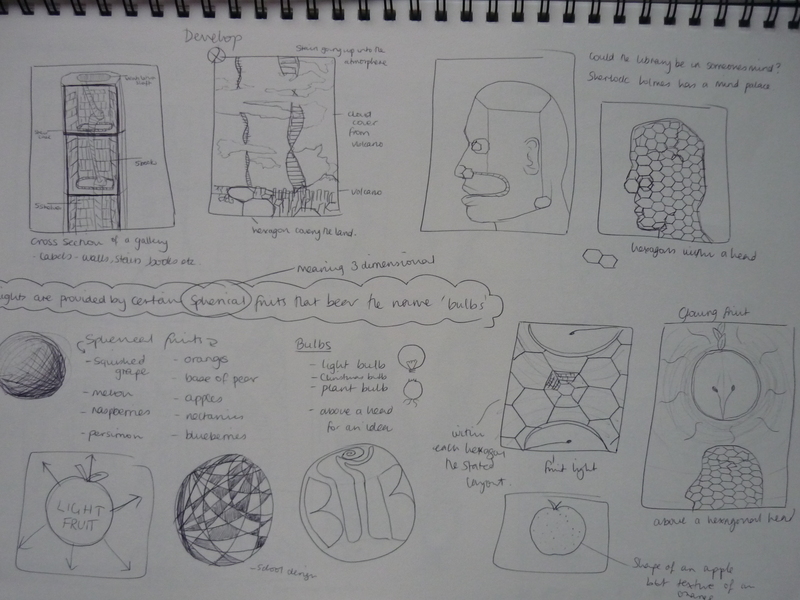 For part of the course I have to write a blog which is new territory for me, I will be showing my progress throughout and post some of my work up which I hope you’ll like! This entry was posted in Me!.